"Prisoners," wrote Supreme Court Justice Anthony Kennedy, "retain the essence of human dignity. . . . A prison that deprives prisoners of basic sustenance, including adequate medical care, is incompatible with the concept of human dignity and has no place in civilized society." This sentiment, announced in the seminal case of Brown v. Plata, 563 U.S. 493 (2011), is the climax of a series of federal lawsuits filed by prisoners in which California's overcrowded, underfunded, and inhumane prison system was challenged, and ultimately required by federal judges to depopulate. This case, along with precursors such as Madrid v. Gomez, 889 F.Supp. 1146 (N.D. Cal. 1995), Coleman v. Wilson, 912 F.Supp. 1282 (E.D. Cal. 1995) and Plata v. Davis, No. C1-305, TEH, United States District Court for the Northern District of California, challenged the mass incarceration scheme that has ruled the California Department of Corrections and Rehabilitation since the 1970s. In his new book, Mass Incarceration on Trial, Jonathan Simon, the Adrian A. Kragen Professor of Law at the University of California, Berkeley, carefully and thoroughly examines these cases and the political, social, and judicial context in which they were decided. The resulting text is a highly readable and well-informed deconstruction of the deliberate indifference to an entire class of people that led to the prison system in California. Professor Simon operates from the position that the mass incarceration boom in California was a deliberate and premeditated act. The fears of violent crime that implanted themselves in the American conscious in the 1970s resulted in a public and political preference for total incapacitation of criminals for indeterminate amounts of time, as opposed to shorter sentences combined with rigorous rehabilitation efforts. Thus, it was no accident that while California built only 12 prisons between 1851 and 1980, it built 22 much larger prisons between 1980 and 2000—all of which were intended to be substantially overcrowded. The focus on mass incarceration allowed a culture of complete indifference to the needs of the incarcerated to develop. The first case that Professor Simon examines, Madrid v. Gomez, concerned conditions in the Special Housing Unit (SHU) at Pelican Bay. There, Judge Henderson of the Northern District of California found that the Pelican Bay SHU conditions, as they concerned the use of violent control tactics and the lack of mental health care, violated the Eighth Amendment's ban of cruel and unusual punishment. The lack of proper mental health care was also litigated successfully in Coleman v. Wilson. At the time of this case, Professor Simon notes, California prisons had become "veritable engines of madness." Judge Karlton of the Eastern District of California ordered the State of California to establish a comprehensive system of mental health care capable of providing constitutionally appropriate care for the mentally ill. According to Professor Simon's analysis, this mandate has yet to be met, nearly a quarter century later. The insufficient medical care provided to prisoners in California was attacked in Plata v. Davis. After reviewing the evidence, Judge Henderson, the same judge from the Madrid case, found the medical care provided to the prisoners (or not provided, as the case may have been) to be constitutionally deficient. Three years after California agreed to an injunction pursuant to which it would rebuild and reorganize its prisons such that they would become compliant, Judge Henderson determined that the state was entirely incapable of ever doing so, and appointed a receiver to institute the ordered reforms. According to Professor Simon, "California officials were not capable of reordering the prison health care system. The state correctional staff (not just frontline workers but bureaucrats further up the hierarchy) lacked not just the will to reform but even the capacity to imagine prisoners as human beings." This failure is what ultimately led the California prison system's extreme overpopulation to be declared unconstitutionally inhumane and a threat to public safety in Coleman-Plata v. Schwarzenegger, U.S. District Court, E.D. and N.D. Cal., No. CIV S-90-0520 LKK JFM P and No. C01-1351 TEH, upheld by the U.S. Supreme Court in Brown v. Plata. The Supreme Court, in upholding the appellate court, found that the concept of human dignity applies to prisoners, and that "Respect for that dignity animates the Eighth Amendment prohibition against cruel and unusual punishment." Professor Simon suggests that the Brown decision may indicate a shift away from a civil rights approach to prisoners' rights toward a human rights framework. While the movement away from mass incarceration is being precipitated by federal courts, the author suggests that further reform should come from political and social directions. Professor Simon writes with the pen of the sociologist, psychologist, and law professor, and the result is one of the most well-rounded indictments of failed criminal justice policy in recent memory. The conditions that led to the failures in California, the disturbing reality of those failures, and the state of mass incarceration in the rest of the country are all delivered to the reader in a powerful and moving manner. California's problems are present in all of our prisons as a result of policies that have mass incarceration as an express goal, and the societal and cultural attitudes that allow the inhumane treatment of prisoners. 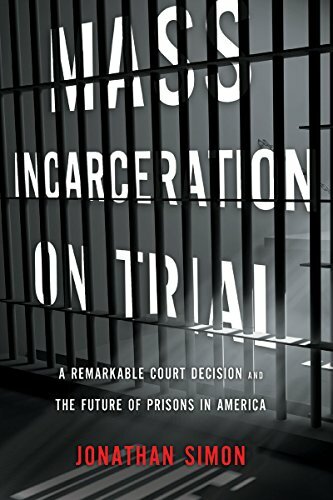 As the country moves toward criminal justice reform, those who are interested in a well-rounded understanding of how we got to the point that reform has become an absolute necessity must read Mass Incarceration on Trial by Professor Jonathan Simon.